Big Berkey Water Filter Stainless Steel Bundle: 2 Black Filters, Stainless Steel Spigot, 1 Stainless Steel Water Bottle (2 Gallon Big Berkey) by Berkey at Friv 4 Friv . MPN: 43180-16322. Hurry! Limited time offer. Offer valid only while supplies last. 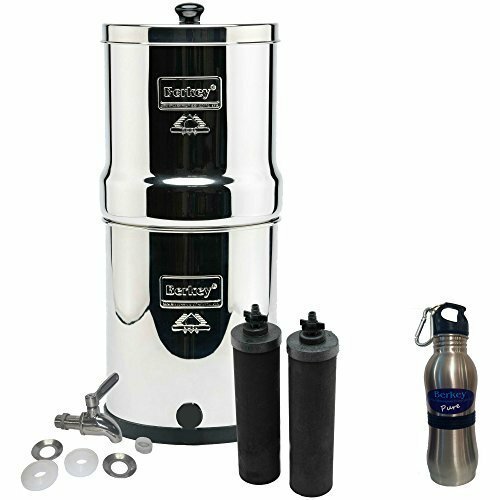 Big Berkey Water Purification System SYSTEM: This system holds 2.25 gallons and is constructed of highly polished AISI 304 stainless steel. EVERYTHING INCLUDED: System includes upper and lower stainless steel chambers, 2 Black Berkey® Purification Elements, 2 wingnuts, 2 washers, 1 priming button, stainless steel lid with handle, a rubber gasket to protect the base, and an upgraded Stainless Steel Spigot. BUNDLED WITH STAINLESS STEEL WATER BOTTLE AND SPIGOT: Stainless steel BPA free water bottle with Rubber Grips. It is 10.5 inches tall, 2.5 inches wide and holds 24 ounces. Also includes upgraded Stainless steel Spigot. DURABILITY: Each Black Berkey® Element is designed to purify approximately 3,000 gallons of water before needing replacement; 2 elements in a Berkey system will purify approximately 6,000 gallons of water before replacement is recommended. Can be cleaned up to 100 times using a Scotch-Brite pad.